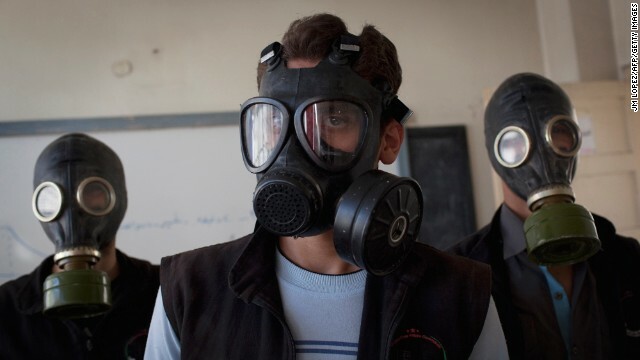 Volunteers wear gas masks during a class on how to respond to a chemical attack, in the northern Syrian city of Aleppo on September 15, 2013. For two months, Mohammad Zayed, an Aleppo University student, has been training a group of 26 civilians in the hope they can respond to a chemical attack. Syria continues to move its chemical weapons after making a public declaration that they exist. The official says the latest intelligence information shows there is movement at additional sites beyond what the United States had observed in the past two weeks. “It’s continuous but still unclear what they are really doing,” the official said. Syria submitted an "initial disclosure" of its chemical weapons program, a spokesman for the Organization for the Prohibition of Chemical Weapons said Friday. It’s part of a diplomatic effort to eventually turn those stockpiles over to international control. While Syria previously moved chemical stockpiles around apparently to avoid the risk of them falling into the hands of rebels, the motivation is not clear this time. The question is, as CNN reported on Thursday, whether the movement is part of an effort to account for the stockpiles to the United Nations or hide it. At this point, the United States has no reason to believe the weapons are not secure. But as CNN previously reported, there is also disagreement within the intelligence community about whether the United States knows the location of the entire stockpile. Really, CNN is even incapable of monitoring it's public blogs? Anything could be posted here! You guys are becoming such a joke! This sounds very curious to me. Even though we have no idea what Syrians are doing, this matters to every country. Use special methods to keep track. When this starts moving (when the details are done and destruction is started and moving along, visit the sites in question and see if you can make sense of it. Alternatively you could just ask. They are being pretty open about this, to the point if it is anything it is likely a legit consolidation , as a distraction to cover the small amounts of more active compounds they don't want to declare. Situational awareness is important. Not to get focused on the obvious so to say. Hot topic: The Spain King giving budget to built and University of Carabobo in Spain with the same name to the Carabobo estate Venezuelas University. We develope a Bank Model in University of Carabobo. Tema Caliente: El Rey de España esta financiando una Universidad de Carabobo con el mismo nombre de la Universidad de Carabobo en Venezuela. Al parecer estan tratando que cuando mueran los testigos de los estudios de la raza humana, todos los proyecto de la Universidad de Carabobo en Venezuela parezcan de manera ilegal como de Universidades en Europa y España. Que sospechoso parece que construyan una universidad con el mismo nombre de la Universidad de Carabobo en Venezuela. Denunciamos al Rey de España por robo, asesinato, violaciones y este no emite comentario. Todo esto por el Banco Perfectible. TO DAY NORTH AMERICAN AGENCIES KILL 376 CHILD. ITALIAN X MAFIA AGENTINE AGENCIES ARE PAYNG TO KILL PEOPLE. ANOTHER AGENCIES IRRADIATE VENEZUELANS TROUGTH THEY EYES. GLOBOVISION ITS HIDING THE CASES. NO VIDEO AGENTS CLEANING WITH BLECH88QUIMIC SUSTANCE. Reblogged this on World Chaos News. Do you want those chemicals to sneak out of Syria, Nooooo, right !!! So let's bomb Syria and make sure not even a can of Pepsi can leave the country.